Taipei World Trade Center Nangang Exhibition Hall (Chinese: 台北世界貿易中心南港展覽館; pinyin: Táiběi Shìjiè Màoyì Zhōngxīn Nángǎng Zhǎnlǎnguǎn), also known as TWTC Nangang or TaipeiEx. It is a superimposed purpose-built exhibition complex in Nangang, Taipei, Taiwan. 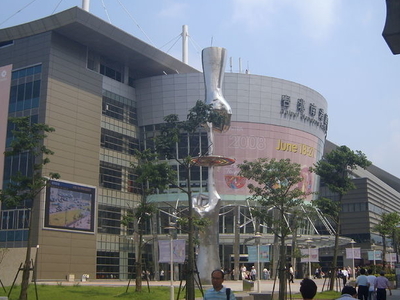 It consists of two exhibition halls, one over the other and is located to the east of the Taipei World Trade Center (TWTC), about 15 minutes’ drive from the TWTC along the Huandong Expressway.The complex has the capacity to host 2,626 standard-size (3×3 meters) booths and occupies an exhibition space of 47,000 square meters. Construction began in March 2005, costing US$ 110 million, and was completed in 2008. The exhibition hall on the ground floor has a total of 23,905 square meters with a capacity for 1,314 standard-size exhibition booths, with each booth measuring 3-meters-by-3-meters. Its lowest ceiling is 9 meters high and floor loading weight capacity is 5,000 kg per square meter. Electricity and water supply lines are paved beneath the floor surface. The floor can be divided into three areas to accommodate three events taking place at the same time. The 23,104-square-meter area has a capacity for 1,312 standard-size vendor booths, a column-free hall on the fourth floor with an average clearance height of 18 meters. 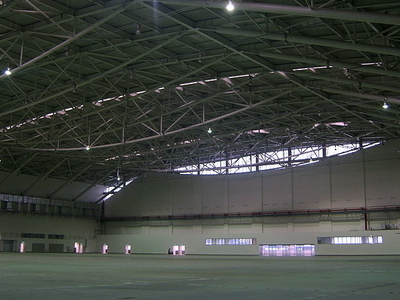 It is a sufficient venue for large-scale trade shows, conventions, sports or other events. It has a floor loading capacity for 2,000 kg per square meter with concealed electricity and water outlets. Two large entrance halls, 1,200 square meters and 850 square meters respectively, are located both on the ground and the fourth floors and can be used for registration, meeting areas, information distribution, and other pre-function activities. 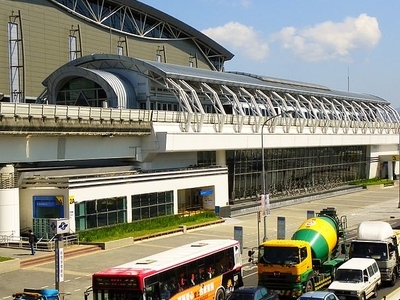 The Exhibition Center is served by the Taipei Metro via the Taipei Nangang Exhibition Center Station. Construction began in June 2012 on a NT$7.26 billion (US$243 million) second exhibition hall. The nine-story building will be situated on a 3.36-hectare lot and is expected to be completed by 2015. Here's the our members favorite photos of "Key Buildings near Nangang District". Upload your photo of Taipei World Trade Center Nangang Exhibition Hall!